Charlotte Bronstein spent 50 years acting, writing and directing for television, film, radio and the stage in the United States and Canada. Her innovative approach to teaching earned her a Lifetime Achievement Award in the Arts by the City of Ojai. In addition, she received the J.C. Penny Golden Rule Award for outstanding volunteer service and has been named Ojai Citizen of the Year and an Ojai Living Treasure. She spent her “retirement” years presenting creative drama programs in the public schools, as well as writing for local productions. Her innovative teaching techniques took students from concept and rehearsal to finished performance by pursuing a specific topic that is chosen solely by them. The children researched, discussed, and created a play around a subject without the interference of adults. 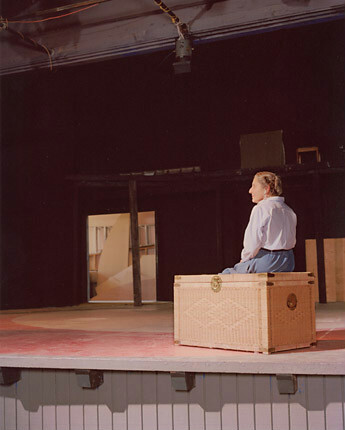 Bronstein acted as a catalyst by guiding students though the process of writing, casting, staging and performing. Through this interactive technique, students developed self-responsibility and confronted social issues such as racism. The results were a remarkable improvement in the children’s attitudes, self-esteem and compassion for their fellow students and pride in the community in which they live. Charlotte Bronstein’s documentation took place in 2000 and was sponsored by Paula Spellman. The FOTM Archive contains extensive information about this artist.